How do you define greatness? Semantics presumes that there are three key steps. Denotatively Merriam-Webster would say, “exceptionally high quality.” Then you take its connotation – the idea or feeling it evokes – in this regard that could be praise, immortality, any number of things really. And then there is the myth it creates. Say greatness and you might think Babe Ruth, Michael Jordan, Meryl Streep. They’re typically real or fictional people who consciously appeal to us, who embody the same emotions and aspirations we hold. 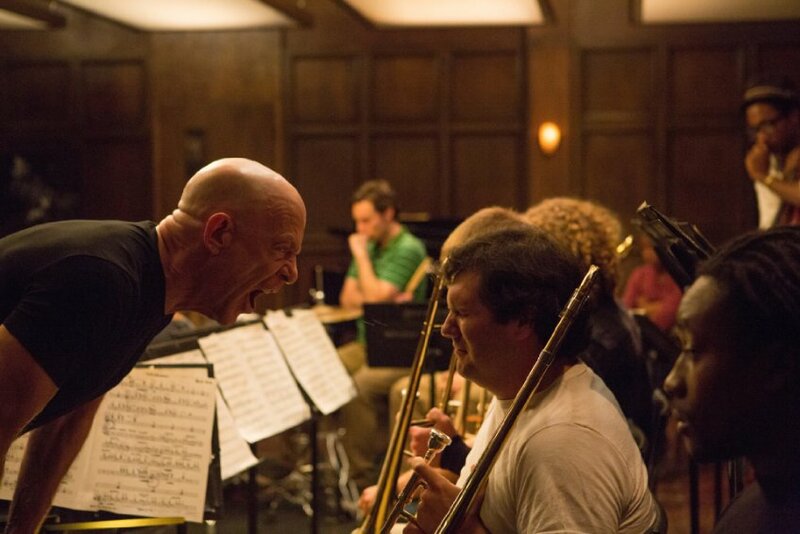 In Whiplash, a determined young man looks up to the great jazz musicians. The Buddy Richs and Charlie Parkers of the world. That’s who he wants to be; that’s his definition of the word. 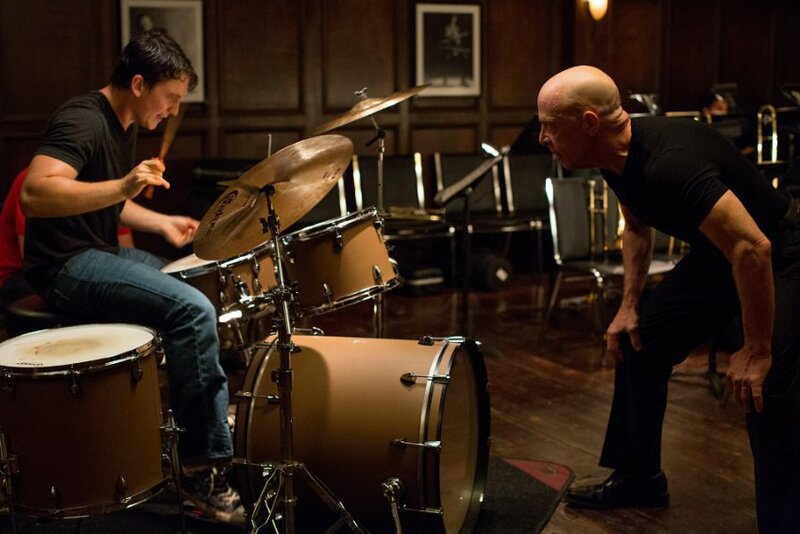 His thought process seems to be, “emulate and replicate.” Whiplash is an indescribably flawless film. Not only is it one of the best I’ve seen this year, but it’s one of the greatest, how I define it, that my eyes have had the privilege of seeing. New York’s fictional Schaffer Conservatory of Music, clearly a stand-in for Juilliard, is the top music school in the country. Only the best and the brightest. 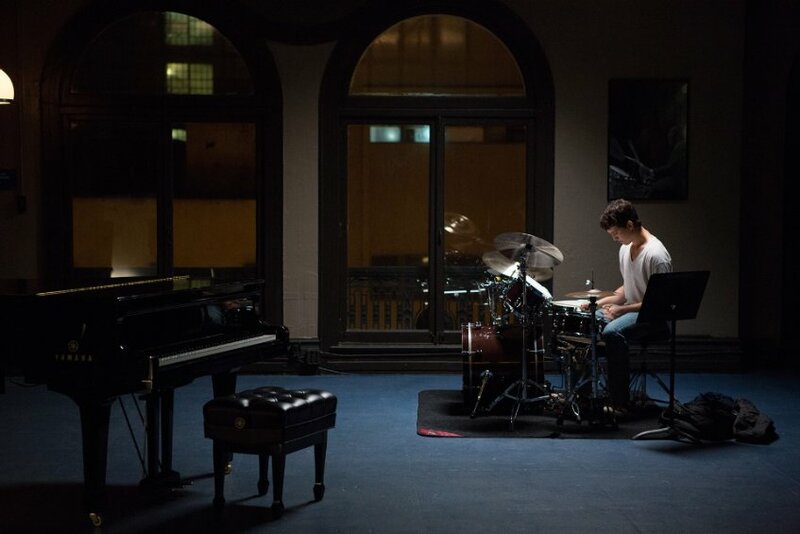 The fresh-faced Andrew Neiman (Miles Teller) is a 19-year-old jazz drummer with aspirations for, you guessed it, greatness. His work ethic is tireless and his social life is non-existent, save for going to the movies with his father (Paul Reiser) and a brief fling with the theater’s concession girl Nicole (Melissa Benoist). Andrew shies away from parties and socializing to practice. 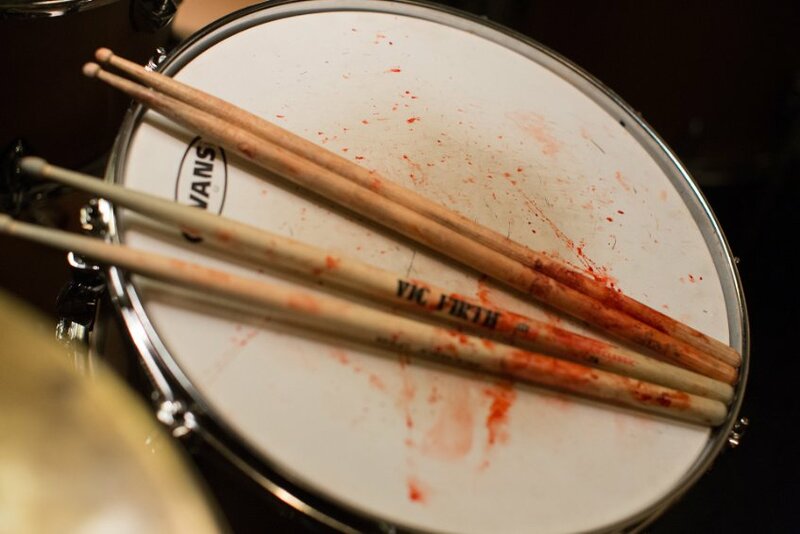 To play until he bleeds, then replacing the bloodied band-aids with a fresh set and playing some more. Nothing matters to him outside of perfecting his craft. It’s praiseworthy and disturbing all at once. He means well and thinks his decisions are for the best, but you’d never be pals with the guy. When asked if he has friends he replies, “I don’t know, I just never saw the use.” The puppy dog front masks a cold, standoffish heart. The conductor for the competition jazz band, Terence Fletcher (J.K. Simmons), spots Andrew during one of his late night practice sessions. He watches him, leaves, and over the course of the film we see the same scene almost identically played out with varying volumes of ferocity. Andrew’s a glory hound pupil endlessly seeking the approval of his rigorous teacher. But that’s not so easy. Fletcher’s a master manipulator of emotions, capable of flipping his bipolar switch from wisecracking jocularity to Full Metal Jacket insults without a hitch. His band looks down as he enters the room, presumably how he likes and prefers it. But there’s always a hint that the relationship between Andrew and Fletcher is different. That, like soul mates, their inadequacies make the odd couple perfectly compatible. The intensity of their confrontations and the tension built up until the very last shot is, for the lack of a better word, nothing short of spectacular. There’s no hyperbole in that statement. Unlike the leads of the film, writer/director Damien Chazelle had to do an audition of sorts. He took one of the movie’s integral scenes, shot it as a short film, and successfully presented that to production companies to get financing. Simmons had incredible foresight to take a leap of faith and sign on to the project in its earliest stages with no guarantee that it would someday be a feature. Shot with a minimal budget in 20 days, Chazelle deserves Oscar nominations for both his writing and directing. Like the title’s main side effect, it’s edited at a breakneck pace and constantly engaging. You’ll be on the edge of your seat, hands over your mouth, compelled by the drama and perturbed by the truly unsettling story. I’m a nail-biter by habit. Once I left the theater I noticed my right middle finger was bleeding. What unfolds will leave you speechless. Simmons completely knocks this career performance out of the park. Typecast as the father figure of late, he goes deeper and darker than we’ve ever seen him. Most people who have competed in any area at any level have had the mentor with questionable tactics and old school methods. Terence Fletcher is a physically imposing drill sergeant, arriving to class exactly on time and vehemently shouting vulgarity. Expect to hear plenty of acceptance speeches from Simmons. As for Teller, I firmly believe he is the next great American actor. He announced his presence in Rabbit Hole and even in his bad films, which he’s had his fare share, you can’t help but acknowledge his charisma and talent. His development over the past 4 years has truly been astounding. The film’s clear theme circles around whether or not ends really do justify the means. If the mental anguish and psychological dismemberment Fletcher employs will push someone who is good to be great, or if it will bring the pursuit to a complete standstill. Damien Chazelle’s impeccable directing and inventive shooting style is wise beyond his years. Music is the bloodline of the story, but I can imagine this being just as successful and effective as a silent film. It’s no mistake that the film opens with pitch black and the slow crescendo of a snare drum, sounding like a death sentence march into war. 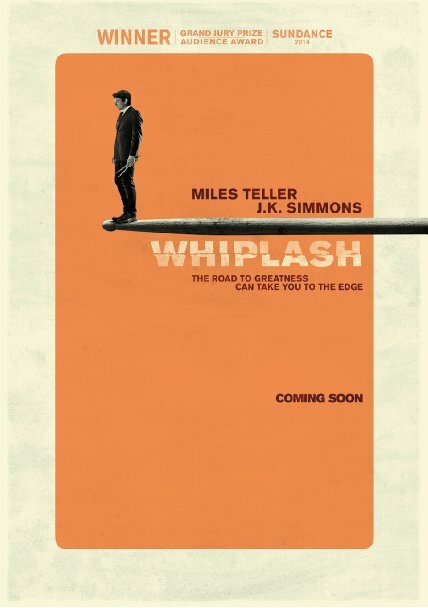 Whiplash is, bar none, the best film released this year.